This book proposes solutions for our broken immigration system, which has created a large population of immigrants residing in the United States with no legal right to work but working nevertheless, at great risk to themselves and their families. This failure undermines the rule of law, undermines labor standards, and leaves millions voiceless and defenseless against exploitation. 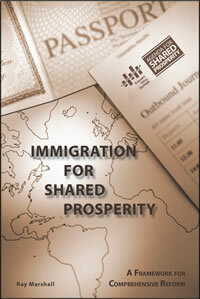 The book sets out policies that strengthen the rights of all workers to find appropriate work at a fair wage, from U.S. resident engineers looking for work with high-tech companies to workers without a high school education willing to work as laborers or dishwashers, from undocumented foreigners hoping to escape the underground economy to immigrants hoping to build a new life here. The five principles for comprehensive reform described within are interrelated and interdependent. An objective method of determining labor shortages that must be met with foreign workers, a secure work authorization system that removes employers from the process, border security and improved internal control of foreign visitors, adjustment of status for the current undocumented population, and reform but not expansion of temporary “guest worker” programs. About the Author: Ray Marshall was Secretary of Labor in the Carter administration. He is Professor Emeritus and holder of the Audre and Bernard Rapoport Centennial Chair in Economics and Public Affairs of the LBJ School of Public Affairs at the University of Texas. He is author of more than 30 books and monographs, and one of the founders of the Economic Policy Institute. About The Agenda for Shared Prosperity: Developed in collaboration with some of America’s top progressive thinkers, EPI’s Agenda for Broadly Shared Prosperity is an effort to chart the way to stronger, more sustainable economic growth and the restoration of the defining dream of our society – broadly shared prosperity with opportunities for upward mobility.